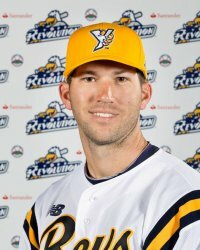 Although Justin Greene was named York Revolution MVP for 2014 as he won the Atlantic League batting title and set York’s all-time mark, it was hardly an easy decision. All Chad Tracy did was finish second in the league in home runs and lead the league in RBI. 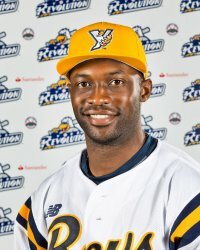 Eric Patterson could also stake his claim to the hardware, after he rolled up a Revolution-record 67 extra base hits. He surpassed Chris Nowak’s record of 63 in 2012, 34 of which were homers. Patterson, who established a new Atlantic League single-season record for triples with 17, extending a record he surpassed with this 14th, added 15 home runs and 35 doubles while hitting .301 in 132 games. 67 is two short of the league record for extra base hits in a season, which belongs to Tommy Everidge of the 2011 Lancaster Barnstormers. Last season in 62 games with York, Patterson collected 34 extra base hits, (15 doubles, six triples, 13 homers), giving him 101 extra base hits in a Revolution uniform. That is 27 shy of the franchise mark of 128 held by Scott Grimes. Should Patterson return to York next season, that record is in peril. In a saga that lasted until the final day of the regular season, the York Revolution at long last, after clinching a postseason berth on July 5, know who their opening round opponent is. York (78-62 overall), who won the Freedom Division first half title by two games over Lancaster with a 41-29 record will play second half-winning Sugar Land (80-60 overall), who took the latter half with a 42-28 record. 42-28 matched Lancaster’s second half record, and the first tie-break of head to head record decided nothing, as it was 10-10. The second tie-breaker is second half games only, in which Sugar Land had a 5-4 edge, giving them the division. Because Somerset (85-55 overall) won both halves of the Liberty Division, a wild card slot opens up as there are four playoff teams in every Atlantic League postseason regardless. That spot is filled with the club that did not win a divisional half with the best record over both halves, which is Lancaster (81-59 overall). For the first time in York Revolution history, the club has produced the Atlantic League batting champion. Right fielder Justin Greene’s .358 effort this season is his second consecutive league batting title, after he was the top hitter in the Double-A Southern League a season ago for the Mobile BayBears (Arizona Diamondbacks). 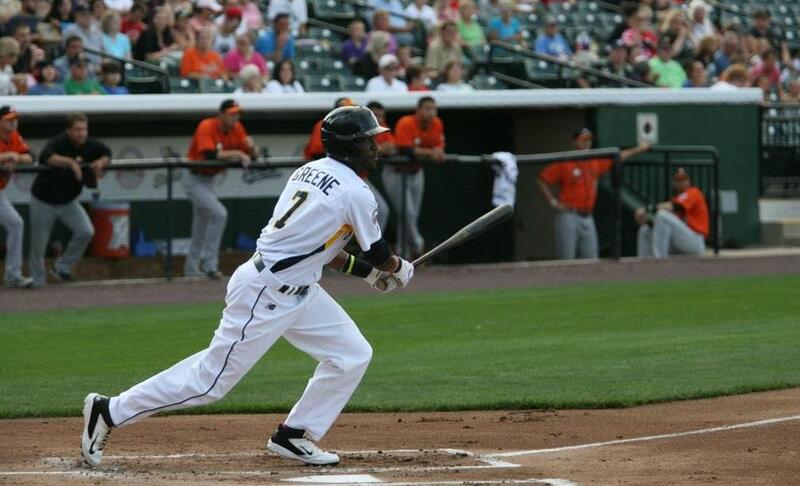 Greene, who peaked at .393 this season and for much of the year threatened the Atlantic League single-season batting record of .371 (Vic Rodriguez, Somerset ’04), allowed little drama into the race. He finished 11 points ahead of Long Island outfielder Lew Ford (.347). Greene’s breaking of the York single-season franchise record was decided weeks ago, as he breezed past Ramon Castro’s mark of .339 in 2010. He ended up with the fourth-best season average in Atlantic League history, and was the first player to bat over .350 since 2007. Although he fell three RBI short of the third 100-RBI season in York Revolution history (107 by Chris Nowak in 2012 and 105 by Jason Aspito in 2008), first baseman Chad Tracy finished with the most runs driven in the Atlantic League this season. Tracy’s 97 RBI were two better than Long Island outfielder Lew Ford, the former Twin and Oriole. His 23 home runs helped him get there, a mark good for second in the league behind the 26 of Lancaster outfielder Cole Garner. Tracy becomes the second Rev to lead the Atlantic League in RBI in the franchise’s eight-season history, joining Nowak. His 23 home runs tie the fourth-best showing in franchise history, joining Andres Perez’s 23 in 2012. Nowak hit 34 in 2012, 25 in 2011 and Aspito hit 24 in 2008. Justin Greene’s 0-for-5 night in the Revolution’s 2-1 loss at Sugar Land on September 19 was rare…really rare. Even for a guy hitting in the .36os. It snapped a 21-game hit streak for Greene, which was the longest for York this season. Johan Limonta assembled an 18-game streak in the first half. Unfortunately Greene was just one base knock away from securing the longest streak of the season in the Atlantic League. Long Island outfielder Fehlandt Lentini had two separate 21-game streaks of his own. Greene has gone hitless in just 16 games this (ALPB) season. After signing with York on May 23, he’s hit safely in 90 of the 106 games he’s played with the Revolution. 21 games is the fifth-longest hit streak in Revolution history. The longest is of course the Atlantic League record as well, when York first baseman Chris Ashby hit in 31 consecutive in 2008. With the book closed on the regular season home schedule at Santander Stadium, the final numbers have been tallied on attendance. 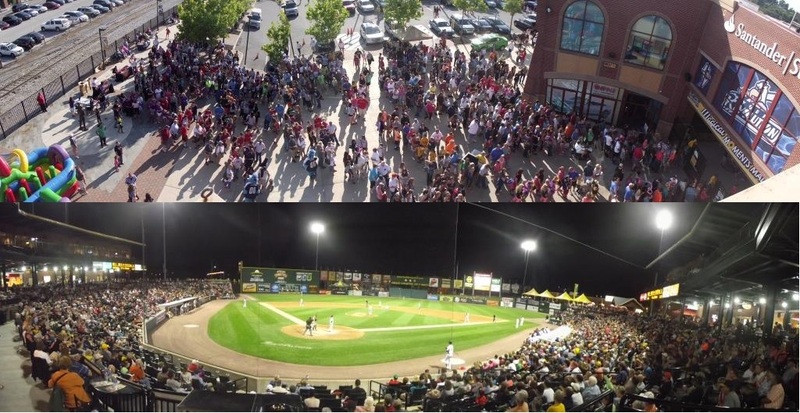 The 2014 York Revolution drew 3,937 fans per game in 68 openings, an increase from the 3,741 drawn in the same number of openings in 2013. It’s an increase of 5.2% over the course of the season. By comparison, aggregate attendance for all MLB-affiliated minor leagues rose 2.1% in 2014, according to numbers released by Minor League Baseball. Now that the official-sounding stuff is out of the way…thank you fans!